Today, as we demonstrated in our last translation , the new populist “government of change” made up of the anti-European Five Star Movement and the racist Lega (The League, formerly the Lega Nord or Northern League) has begun to adopt some of the same empty rhetoric of the past. Their target is not much different from the fascist anti-semitism of the past. Whilst their main guns are today trained at the EU they also point to the nefarious activities of “financiers like Soros”. George Soros is of course the target of the anti-semitic campaign of Orbans in Hungary. According to these “populists” the problem is not capitalism but only some aspects of it. The two Deputy Prime Ministers, the League’s Salvini and the Five Star’s Di Maio has even made the talk of “the spread”, i.e. the difference between what Italy has to pay for its debt over that of Germany, an everyday preoccupation since it threatens the fantasy behind their spending agenda. A crisis that, we repeat for the umpteenth time, is far from over, and is deeper in Italy than in most other countries. There are a number of reasons for this, not least, a public debt over 130% of GDP and which is still growing. If the president of Confindustria has let slip explicit – and unusual – words of appreciation for the League (he then corrected himself), it is perhaps because a part of the boss class votes for the ex(? )-Padanian  party. However the expressions some bigwigs of Italian capitalism used to describe the government were quite different in tone. If the term "infuriating" were used against the two Deputy Prime Ministers, it would be no surprise, given what emerged at the meeting of the Federazione dei Cavalieri del Lavoro (Federation of the Knights of Labour), held in Turin on 29 September. Il Sole 24 ore (30 September) does not say whether there were workers among the “knights” and, in any case, whether they were present, or were silent or said nothing relevant, because this Confindustria mouthpiece only recorded the comments of the big players, who unanimously agreed to mercilessly crush the financial plan and, above all, the so-called citizens income. The performance of “Deputy Prime Ministers” has only just started, so we cannot predict how long the show will be on stage, but of course, the style of the two principals has already been outlined. It is a style that recalls other characters, and other times. Salvini in particular, assumes indeed, increasingly accentuates a posture and a language that, if born and defined by the Bard (that great c... of D'Annunzio), reached its apotheosis in Il Duce of Fascism, Benito Mussolini. These characters reached almost unparalleled heights in the art of smoke and mirrors and now their Padanian offspring tries to take up the legacy, in verbal terms sure, but, in some ways, not only that. Are the strong powers in the European Union, against the people? ME NE FREGO! I'm going on the same way, which is the equivalent of Mussolini's machismo motto NOI TIREREMO DIRITTO (nothing will stop us)! We are only missing WE WILL make mincemeat of the SPREAD! , that is to say to the clique (not that democratic-Plutocratic-Jewish one of fascist imagination, but the cosmopolitan elite of Frankfurt) and here history is really repeating itself as farce. The Prime Minister Conte is widely regarded as a puppet of the two Deputy Prime Ministers. 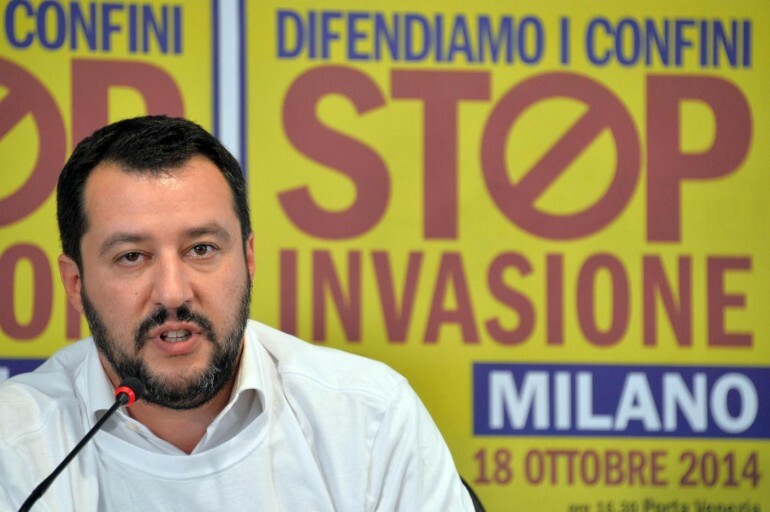 Salvini is the main gainer so far as he as Minister of the Interior by talking tough on immigration (and refusing to allow the migrant rescue ship Valeria to dock in Italy) has boosted his standing in the polls. The original Northern League was a separatist party and wanted to create “Padania” (the territory around the Po Valley in Northern Italy) hiving off the rich North from the poor South of the country. Italian equivalent of the Financial Times. Confindustria is the equivalent of the bosses organisation the CBI in the UK. For “spread” read “the Greeks” Mussolini said something to the effect that he would soon defeat the Greeks when he invaded in 1940. The Italian Army was humiliated and Hitler had to send in German troops to save it from catastrophe.